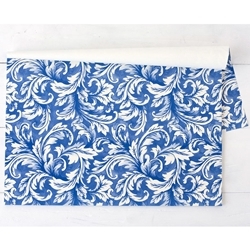 Decorate your table with placemats in a beautiful China Blue pattern. Just tear off each placemat, decorate the table and throw away when done! • Pack of 25 • 30% Recycled Materials • Soy-Based Ink • Disposable • 12" x 18"
Disposable Paper Place Settings for Serving, Dining, Decorating!